03:00 Weather, local, provincial and international news highlights. ACORN fights BC budget impacts rally planned 24 Feb, Syrian refugee settlement supports lacking but feds restoring health benefits, American white supremacist talk planned March 4 at Railway Club and UBC students planning counter-protest, Southern Poverty Law Centre reports increase of rightwing hate groups in 2015, and more. 31:00 African Refugees: We explore the issue of Forgotten and Excluded People with Josiane Anthony, Togo-born, Refugee-bred who is an aspiring lawyer, with an interest in refugee and immigration issues. 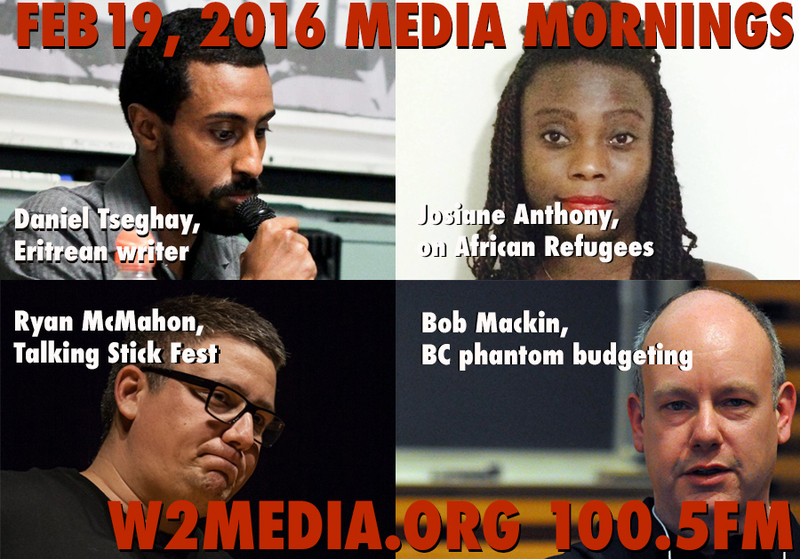 Plus Daniel Tseghay, an Eritrean writer and activist in Vancouver. The two will be speaking in Vancouver on Tuesday, Feb 23. 50:00 Bob Mackin, Investigative Journalist on the BC budget, phantom funds from the BC Liberal government, and how this sets up the next 2017 provincial election.